Scrappy Palace: May Reveal Time! Hello everyone! 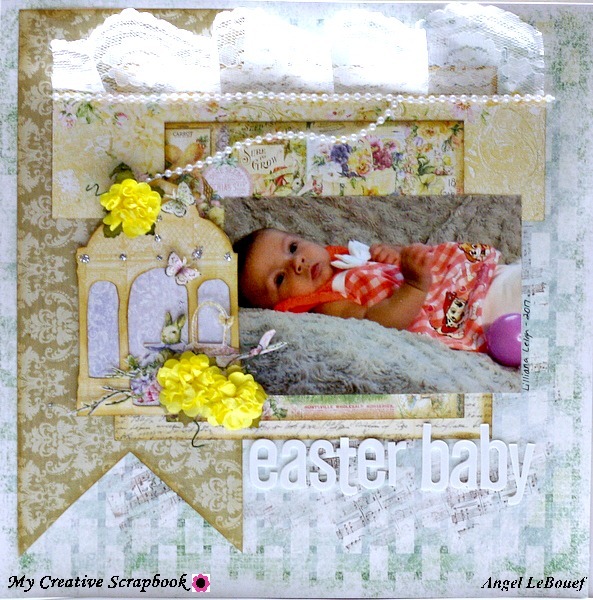 Today I would like to share with you my may LE kit from My Creative scrapbook! You already Know Pam's Kits are fabulous and has so much beauty in them. I have to share with you this months kit! Here is a few layouts I created using the kit! 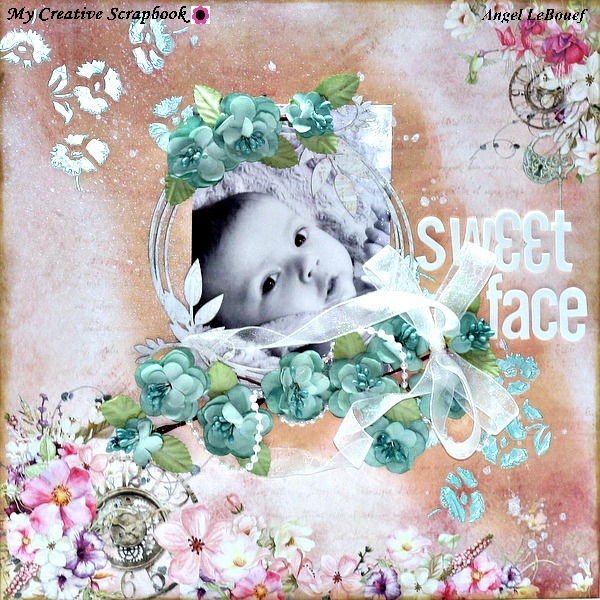 This layout I used a picture of my sweet godchild Lilliana! She is growing oh so fast. 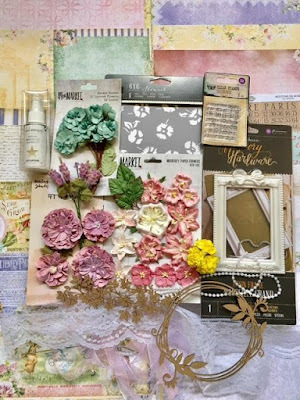 I loved the chipboard piece and all those gorgeous flowers this kit had. I painted the chipboard in white acrylic paint and Clustered flowers around it to pop out her beautiful little face. I also used a stencil that came in the kit to make the mint flowers you see in top and bottom corner. This layout I just had to cut into this paper line ! 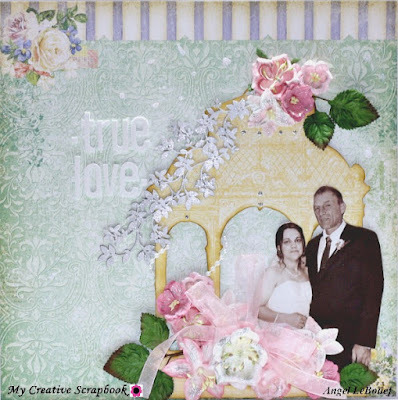 I cut out the gazebo and popped it up with pop dots.I just had to capture My Best Friend and her wonderful Husband on there very special Wedding Day! They Have been some special people in me and My Husband's Life. We could not ask for better friends. My Grandmother! The sweetest person in this world to me. She had passed away last year and we miss her oh so much. My Heart has a piece missing since she has been gone. So I did this layout as a tribute to her as it was her birthday in April. I just loved the resin Frame that was included in the kit. 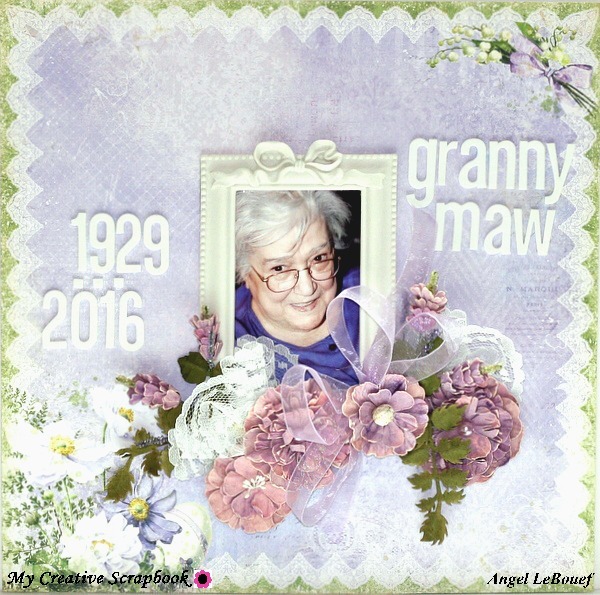 This paper was perfect for her as her favorite color was purple and Lavender. Here is another layout of My Special little godchild. Again I had to cut out the gazebo ! I guess I was my go to in this paper line. I added the lace to the top and some bead string as well. This also was based on the Sketch over at My Creative Sketches this month so Please go check it out and play along!